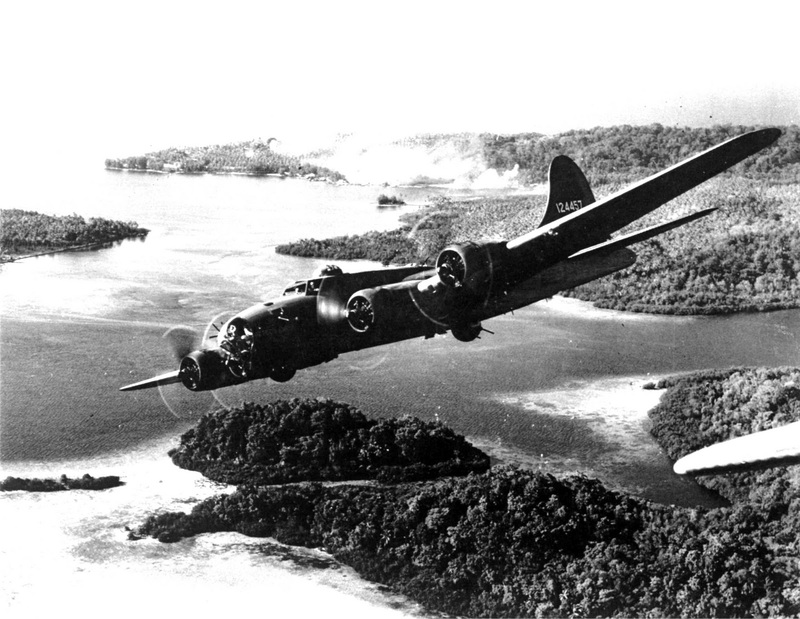 » B-17F Fortress “The Aztec’s Curse” of the 26th Bomb Squadron returning from an attack on Ghizo Island in the Solomons flying over Rendova Island, Oct 5 1942. This photograph has been scaled down; full resolution photograph is available here (1,600 by 1,238 pixels). Would be interesting to find out what the ultimate demise of The Aztec's Curse was. Survived the war, scrapped? To Vh Hurtado: As the Allies moved up the Solomon chain, Rendova became an important forward base following the island’s capture in mid-1943. The real-life Black Sheep Squadron (VMF-214) was formed in Aug 1943 and flew in support of the advancing Solomon campaign, with the Rendova base playing an important part of their rear area. The frequent mention of it in the TV series would make sense historically. To Cy White: On Apr 23, 1943 "Aztec's Curse" (#41-24457) experienced brake failure on landing at Momote Field, Admiralty Islands that resulted in a ground loop. The plane was not damaged but a ground tug struck the bomber's tail and the airplane had to be written off. This is not "flying over Rendova Island" as the caption says. The white smoke in the background (just above and forward of the plane's tail) is the waterfront of Gizo town being bombed. All the land on the right side of the photo is part of Ghizo Island. I have been there many times and recognize it clearly. Rendova Island is about 60 miles to the southeast. These planes probably took off from the US base at Rendova.